Will this work on my machine? Yes. You may be used to the shorter, squatter style of spool that companies like Coats and Clark uses. This is a European style spool but works on all machines. Is this a special thread? 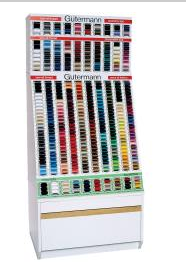 Gutermann's polyester thread is the perfect all purpose thread. It is a standard weight and will work on cotton prints, faux fur, or oilcloth (among other things). A good thread and nice sharp needles will make your sewing experience a great one. GUTERMANN-Sew-All Thread. 100% standard size polyester. Ideal for all basic sewing projects by machine or hand; especially synthetic and blended fabrics. This spool may be a different shape than you are used to seeing but it is universal. We carry a rainbow of colors, a shade for every project. We have 20 shades in the 500m spool. We will be uploading a shade card, but in the mean time, you can tell us to match a fabric you are ordering and we will choose the best match for you, you can specify a color or if you have a spool you have used up just reference the color number.